IMPORTANT! Please plan on attending one of the Parent orientation and information meetings scheduled on the dates and times below. Below is a general description of the preparation process for First Reconciliation and First Eucharist. The Sacrament of Reconciliation is a sacrament of love, healing, forgiveness, and growth. It is an important foundation to a person’s ongoing faith journey. The sacrament helps us to be intentional in our choices to live as loving Disciples of Jesus. And, when we fall short, this sacrament gives us an opportunity to experience God’s boundless love and mercy. 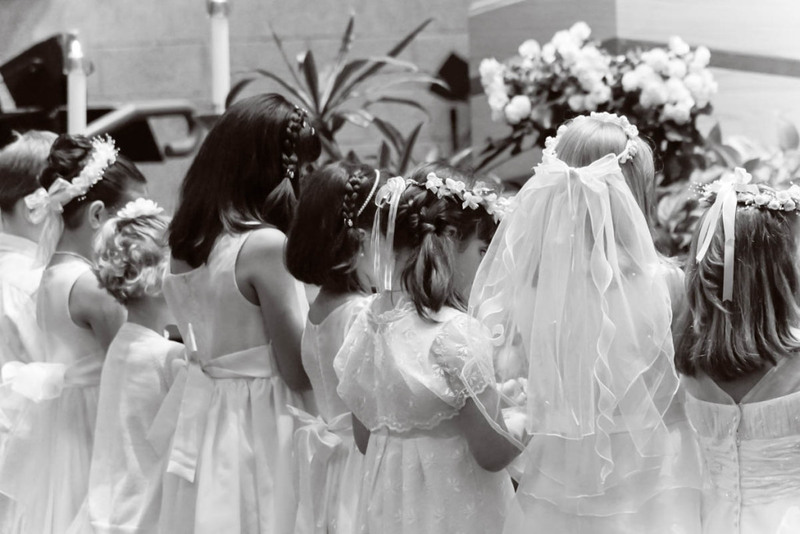 In the Archdiocese of Seattle, children are required to be prepared for their First Reconciliation before they can prepare for their First Eucharist. That is why here, at Mary, Queen of Peace, we begin with preparation for First Reconciliation in the fall with 4 - large group sessions that are offered once a month beginning in September and ending in December. These sessions provide parents and their child an opportunity to gather to make new friends, deepen their appreciation of God’s love and mercy and grow in their knowledge of the Sacrament of Reconciliation. This program requires that at least one parent participate and if possible both parents participate with their child in the process. Preparation for First Eucharist begins in January. We gather for 4 - large group sessions that are offered once a month beginning in January and ending in April. This program requires that at least one parent participate and if possible both parents participate with their child in the process. These sessions provide parents and their child an opportunity to gather to continue to build community with other families, deepen their appreciation of God’s love, explore the meaning of the Mass and this ultimate Mystery of our faith. Christ’s gift, the bread and wine that nourish us in our spirit; and becomes our greatest source to grow in Christ. In addition, families will receive resources and curriculum to work with at home and at Mass. Families will be invited to celebrate the Sacrament of Eucharist in May. Since, the Archdiocese of Seattle requires individuals to be prepared for their First Reconciliation before they can prepare for their First Eucharist. Be sure your child has completed their preparation for First Reconciliation prior to preparing for First Eucharist. Registration forms and schedules will also be available at the parent’s meeting. There are a great many more details about these programs available through the Children and Family Evangelization office. Including registration forms and program schedules. Please plan on attending one of the Parent orientation/information meetings in September. Registration Deadline is for 2018 - 18 is September 12, 2018.